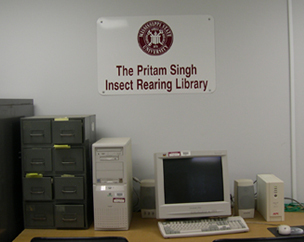 A new and exciting resource is available at the MSU Insect Rearing Center: the "Pritam Singh Insect Rearing Library". In spring 2005, Dr. Pritam Singh donated his collection of ca. 7,200 reprints on insect rearing to Mississippi State University (MSU). Dr. Singh is the author of Artificial Diets for Insects, Mites, and Spiders (1977. Plenum, New York, NY. 606 pp. ), coeditor (w/ R. F. Moore) of the Handbook of Insect Rearing, Vols. 1 & II (1985. Elsevier, The Netherlands. 1,002 pp. ), and author of over 100 additional publications on insect rearing, nutrition, and diets. Dr. Singh is considered by many to have played a pivotal role in the development of modern insect rearing. Spanning the period 1908?1990, this material is unique in the breadth and depth of its coverage of insect rearing. At the 2006 insect rearing workshop, a ceremony dedicating the library (still a work in progress) was held in honor of Dr. Singh. Entry of the bibliographic information for the items in the Pritam Singh Insect Rearing Library into the bibliographic database EndNote™ has now been substantially completed, and the items themselves have been housed in filing cabinets in the MSU Insect Rearing Center. As a service to the insect rearing community, the MSU Insect Rearing Center is offering a reprint retrieval service for the items that are no longer under copyright protection: generally all items published in the US before 1923, many items published 1923-1963, and some items published 1964-1977. Upon request (see "Reprint Request Form" below), specified reprints will be scanned and emailed or photocopied and mailed for a nominal fee. Additionally, bibliographic searches can be performed to determine holdings of the library on a particular topic and the results emailed or mailed for a nominal fee. For additional information, please contact Dr. John Schneider, Box 9775, Department of Entomology & Plant Pathology, Mississippi State University, Mississippi State, MS 39762, (662) 325-2977, or jcs1@msstate.edu.